4 文献２：A randomized, double-blind, placebo-controlled study of escitalopram in patients with socialanxiety disorder in Japan. 5 文献３：Comparative efficacy and acceptability of 12 new-generation antidepressants: a multiple-treatments meta-analysis. 文献２：A randomized, double-blind, placebo-controlled study of escitalopram in patients with socialanxiety disorder in Japan. 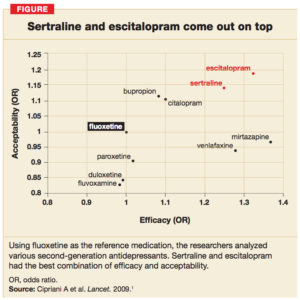 文献３：Comparative efficacy and acceptability of 12 new-generation antidepressants: a multiple-treatments meta-analysis.